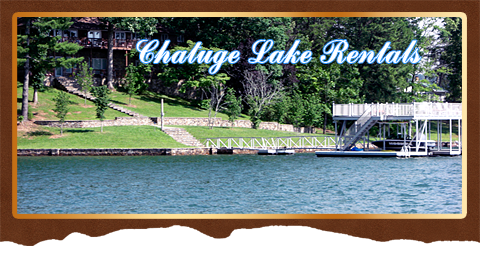 Chatuge Lake Rentals, is your best choice for vacation lodging on Lake Chatuge in the North Georgia Mountains. From rustic yet elegant cabins, romantic cottages to lakeside luxury homes, we have it all. Our properties are located on Lake Chatuge which wraps its 132 miles of shoreline around the mountains and valleys of Hiawassee & Young Harris, GA and Hayesville, North Carolina. We offer North Georgia vacation rentals to fit your needs. All our rentals are on a privately owned peninsula in the secluded, picturesque Cedar Cliff section of Hiawassee. Each of our lake front homes features it's own private floating deepwater dock. All of these north Georgia mountain rentals have magnificent views and are the perfect setting for a Chatuge Lake vacation. Each of our six lakefront homes can be rented individually for as little as 2 nights, or as long as the full season! Each has its own set of amenities ranging from covered porch swings to pool tables, to a cedar hot tub!